Today silver is the most used antibacterial agent on various supports. The silver has many advantage, for example: very high degree of safety to humans, excellent thermal resistance, antibacterial effects on different bacteria and a long-term duration of antibacterial effects. Cellulose and cotton fibers with antimicrobial properties are most suitable for surgical operations and medical treatment for their excellent moisture absorbency, water absorbency and flexibility, while polymer fibers are most suitable for automotive tapestry and air filtration fields. Our research group has developed an antimicrobial treatment for cellulose or polymeric fibers with silver cluster suitable for natural or organic surface. Such patented treatment is very durable on the substrates also after substantial number of standard launderings and dryings and doesn't require binders. 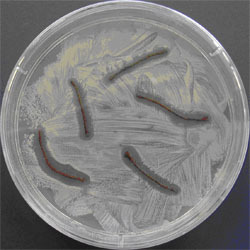 The technique is based on wet impregnation of the substrate in a proprietary silver containing solution followed by desiccation and curing processes. The amount of silver which is deposited is equal to 20% of the treated support weight. Treated substrate exhibits a long kill rate for Escherichia coli JM101 AMERSHAM. Antimicrobial test was conducted to demonstrate the antibacterial properties of the silver based antibacterial fiber. Fig. 1: Test of Escherichia coli JM101 AMERSHAM growth on a sample of 100% spun cotton. 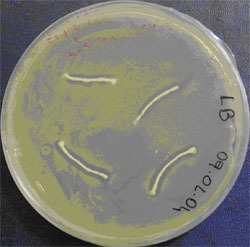 Fig 2: Test of Escherichia coli JM101 AMERSHAM growth on silver based antibacterial fiber. The same test was conducted on a sample of spun cotton previously impregnated with kanamicina antibiotic and on a sample of 100% spun cotton for control purpose. Zone of inhibition were determinated by measuring the area (mm) of no bacterial growth around each sample. In the figure 1 any antibacterial effect is displayed by the 100% cotton fiber. The antibacterial effect of the new technical fiber is shown in figure 2 and we observe a clearly defined bacterial free zone around each sample. The same antibacterial behaviour is shown in the next figure 3 by the sample of spun cotton impregnated with kanamicina antibiotic. Fig. 3: Test of Escherichia coli JM101 AMERSHAM growth on a sample of spun cotton impregnated with kanamicina antibiotic.